. He writes beautifully about, and pours insight into the humanity of those on the row. As elegant and eloquent as the stories are – of the men in his life who know they are going to die, poignant, too, is the story of Dow’s trying to help, both his father-in-law and his death-row clients. In his TEDtalk:Lessons from Death Row Inmates . 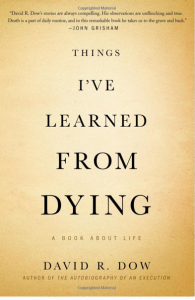 Dow speaks passionately about the wrongness of death penalty – as he does in this book. His sensibilities echo those of my documentary producer brother, John , who always gets to the humanity behind the headlines in his prison-related topics. There’s always more to the story of living and dying.